Course Description: This course examines interrelationships within and between Canada’s natural and human systems and how these systems interconnect with those in other parts of the world. Students will explore environmental, economic, and social geographic issues relating to topics such as transportation options, energy choices, and urban development. Students will apply the concepts of geographic thinking and the geographic inquiry process, including spatial technologies, to investigate various geographic issues and to develop possible approaches for making Canada a more sustainable place in which to live. Students learn about Canada's geography and apply geographic thinking concepts to questions relating to Canada’s size and location, the natural environment, physical landscapes, and the people that have made Canada home, including where Canadians choose to live and work. 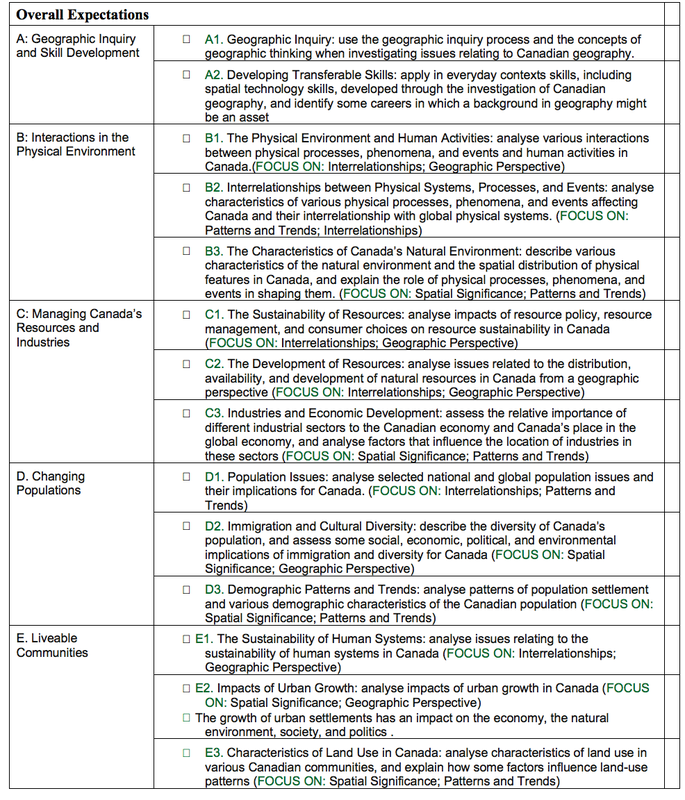 Students learn about Canada's natural environment, including: physical landscape and regional variation, weather and climate, Canada's ecology, biospheres, vegetation and ecozones. Students learn about Canada's natural and human resources. They learn about industries in Canada and how resources and industries contribute to the economic development of Canada. Students learn about Canada's population, including subjects such as: demography, population trends, interpreting statistics, immigration, global influences, settlement patterns, urbanization, and land use. Students learn about sustainability and globalization. Students are asked to assess their own ecological footprints, as well as Canada's footprint compared to other countries.